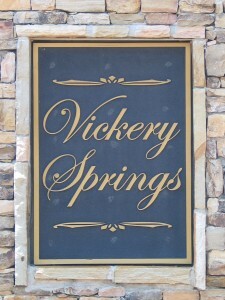 Vickery Springs is a relatively new community started in 2006. Great local custom home builders such as Steve Osley, Rudy & Tony Brown, SR Homes, Clark Porche and Kathleen Day & Associates completed homes in this community. Due to the economic downturn, home construction in the community slowed some between 2009 and 2011, but as soon as the housing market returned, this community quickly became one of the most popular in the area with it’s convenient location to Vickery Elementary, Vickery Middle School, West Forsyth High School, Midway Park, the Big Creek Greenway, local shopping and Georgia 400. This area of Forsyth County is very popular because it is much less dense than the Southeastern corner, resulting in a lot less traffic and larger lot sizes. In this community, some homesites reach almost 3/4 of an acre. The square footage of homes in this community range between about 4,000 and 6,500.